Hey teacher, wouldn’t it be nice to have a little more time to do things properly? Teachers around the world are expected to somehow fit professional growth in-between planning, teaching, marking and parent communication, and so I understand why many don’t get round to much professional development or reading. So it was especially exciting for me to be awarded a 2015 research fellowship by Core Education (NZ). 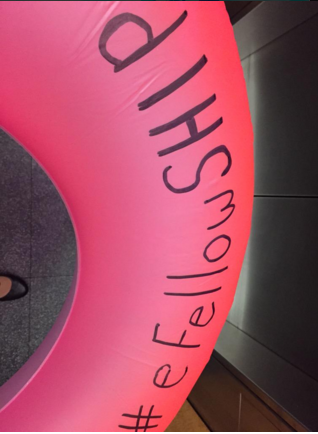 This “eFellowship” is given each year to a small group of innovative teachers to allow them to connect, visit schools and work with Core’s phenomenal team of education experts to carry out a personal inquiry into an aspect of their teaching. Many aspects of the year were inspiring. The first of these was visiting schools. We were lucky to visit early childhood centres, Elementary, Middle and High schools. No matter where we were based personally as teachers all of this visits offered something significant and inspiring. Visiting other types of schools will always offer a teacher new perspectives in regards to what demands are placed on children at other stages. This can lead to a high school teacher realising that younger children are more capable than previously considered, but also an elementary teacher realising they need to do more to prepare their students for high school. What was particularly inspiring was that from ages 4 to 18, we witnessed examples of independent self management of both time and learning. All the schools we saw proved that young people can manage their own learning with successful outcomes at any age. School visiting should be a permanent fixture in all teacher’s professional lives and governments need to fund accordingly. At Core Education (NZ), their team are very well experienced and do tremendous amounts of research in to education in New Zealand. This country is already a world leader in education and so working at the forefront here makes Core Education a force to be reckoned with! We covered EVERYTHING! Be it education’s need for research and social justice (Louise Taylor), cultural awareness (Deanne Thomas), cultural identity (Manu Faaea-Semeatu), future trends (Derek Wenmoth), learning space design (Mark Osborne), learning as play (Keryn Davis) the importance of universal design for learning (UDL) (Chrissie Butler), or research in education (Ann Hatherly), the team challenged us to rethink more deeply many issues faced by education today. The primary benefit of the fellowship was working so closely with the other 6 educators. Their significantly differing backgrounds brought so much depth to the team. Having the time to discuss all our specific challenges made for the type and depth of conversation educators rarely get to experience. I’m now roughly 5.74 times the teacher I was in 2014! If you’re teaching and don’t know of available fellowships / teacher grants near you, then hunt them out. I’m sure there are initiatives and funding in your country or state, they’re not always loudly advertised. 2015 has proved to me that getting your hands on some funding that means you have more time to connect with educators and properly dig deep into some professional reading and thinking will have a profound and positive impact on your future professional life. It will also give you confidence as a professional to seek further opportunities. Finally I want to thank the people at Core Education for organising a fabulous and inspirational year. I’d like to especially thank Louise Taylor and Ann Hatherly for looking after us and our research so expertly and with so much care! Here’s my post about my Research project. If you teach in New Zealand then whatever you do, apply for the 2017 Dr Vince Ham eFellowship! Previous Can social media help manage a successful classroom?